You are here: Home » Where’s the best location for a CSU Stockton? Much has been made recently regarding a potential full-fledged California State University in Stockton, and rightfully so. It’s pretty remarkable that a city of our size has been overlooked for a state school while places such as Humboldt, San Marcos, and Chico have campuses. Even the largely unpopulated Channel Islands has a CSU! Given Stockton’s size and economic need, it’s really only a matter of time before a CSU Stockton takes root here. In fact, the process has already begun as Assemblywoman Susan Eggman’s bill authorizing the feasibility study of such a campus recently passed through the state assembly. And while the prospect of a CSU Stockton is still several years away, that hasn’t stopped speculation about where this university could be located. Not only would a CSU Stockton be a boon the city overall, it has the potential to change the dynamic of the neighborhood where it would be located. Given the high stakes, it’s never too early to consider where a CSU Stockton could be placed. Here’s a handful of the most talked about potential sites for the campus along with the pros and cons of each. Last year, Stockton had the extreme good fortune of having the Stanford Global Urban Development Program (GUDP) come to town to conduct research on the development potential of South Stockton. If you’re interested in their entire body of work, which culminated in a presentation to the city Planning Commission just two months ago, here’s a first-person story SCL published a couple months back. As part of their research, the group looked at the potential for a CSU Stockton campus on the south side. The group focused mainly on a location off of MLK Boulevard and Highway 99, as you can see below. Locating a college campus on the south side makes a lot of sense for that part of Stockton as it could provide a tremendous economic boost and infuse thousands of college students and faculty into a distressed neighborhood. The census tracts around the proposed site indicate extreme levels of poverty, and bringing a CSU to the area could only help to alleviate this. However, while a CSU Stockton would bring some economic benefit to the area, the chosen site has drawbacks that could significantly affect the success of the campus and curtail its overall impact on the city. Chiefly, the connectivity to the rest of Stockton is lacking. While college campuses have the ability to transform a neighborhood, the rather secluded nature of the GUDP site would stymie those potential benefits. The location is boxed in by train tracks to the east and a large industrial site to the north. These barriers would severely limit any potential spillover into the surrounding neighborhoods that could benefit the most. Moreover, while it’s within city limits, the potential site is rather suburban and even rural in feel with no established commercial areas. Given these factors, it would be difficult to establish a cohesion between the university and surrounding neighborhood. Also, this particular site features little proximity to existing areas of industry that students could draw on. Ideally, students at CSU Stockton could get hands on experience at area institutions such as medical facilities or law firms or marketing companies. However, the industries surrounding this potential site are mostly large scale manufacturing. In order to fully integrate into the city’s economy, students would have to travel to other areas of the city for internships and work experience, negating some of the potential positive impact on the surrounding southside neighborhoods. In addition to South Stockton, GUDP also assessed a location in North Stockton along Lower Sacramento Road. In my mind, this location makes the least amount of sense. While spacious, a North Stockton location would be isolated from the rest of the city, limiting its economic impacts. GUDP draws the same conclusion. This location also has zero proximity to any specific industries that students could draw from (unless you count the Alpine Meat Packing facility). And these flaws are not unique to the GUDP site: any campus in the outlaying northern parts of the city is bound to face the same challenges given the area’s poor connectivity and auto-centric layout. On occasion, Downtown Stockton is mentioned as a candidate for a CSU campus. This seems like a logical choice in some respects as a downtown campus would undoubtedly spur investment in an underdeveloped area and bring thousands of students into the city’s business hub. Businesses could tap into the university for interns and graduates could seamlessly transition from student life into the downtown workforce. Also, a downtown campus would easily connect to the rest of the city and region given the multiple transit options available. There is one glaring problem, however: there’s nowhere to put a full campus downtown. As noted by GUDP, a CSU Stockton campus would need a ton of space no matter the location. Unfortunately, Downtown Stockton doesn’t have nearly enough contiguous open space to create a fluid campus. While some universities such as San Jose State are woven into a downtown, these campuses still have a significant amount of congruous land. On top of that, because this campus would most likely be a commuter school, parking would be a tremendous challenge. Sure, some students would arrive by public transit given available transit connectivity, but the majority probably would be driving alone. At best, a Downtown Stockton CSU campus would be a patch work of buildings with little to no open space, no character defining quads or historic buildings. Downtown Stockton is much better suited for satellite graduate and professional programs from the University of the Pacific or other schools. It’s quite common for universities in other cities to invest in small campuses in downtown areas to take advantage of proximity to local institutions. Many MBA, law, medical or other programs are routinely located in urban areas rather than sprawling undergraduate university campuses. For example, UC Davis medical school is actually located in Sacramento. Fresno State just announced that it will open a satellite campus downtown in conjunction with area businesses. The University of Maryland’s policy, law and medical schools are headquartered in Downtown Baltimore. A handful of these kinds of professional programs located in Downtown Stockton would be hugely beneficial without the massive space requirements of a full campus. While a complete university in Downtown Stockton is not feasible, there exists another option that achieves many of the same benefits and in my opinion is the clear, obvious choice for a campus in Stockton: the aptly named University Park. Less than a mile north from downtown proper, University Park is the most logical choice for a CSU Stockton campus. It’s big (just over 100 acres, according the website), has large open lots for new construction and a number of historic buildings that could be incorporated into the campus as well. The area is already well maintained, featuring an abundance of trees, street fixtures and even a pond and water feature. It’s also already home to the CSU Stanislaus satellite campus. And perhaps most importantly is University Park’s proximity to the city’s health care sector and downtown core. One of the major issues facing our region that a CSU Stockton could help alleviate is a lack of health care professionals, so it makes perfect sense to locate a university within close proximity to health care services. Students could easily get hands on training at the adjacent St. Joseph’s Hospital and surrounding health care providers. These institutions are always looking for assistance (in fact St. Joseph’s pays big bucks for Bay Area doctors to moonlight here because of a lack of health care professionals locally). On top of that, Downtown Stockton and it’s 15,000 jobs are just down the street, providing many of same the mutual benefits described above. In addition, the surrounding neighborhood would reap tremendous benefits from a university. Right across the street from University Park sits the Magnolia Historic District, home to some of the city’s finest homes and architecture, though the area has long suffered from neglect, crime and poverty. A university would instantly change the dynamic of this neighborhood and the parallel California Street commercial corridor would see a major improvement as well. Of course this site is not perfect. This site also has a train tracks stopping any spillover to the east. And while listed at 100 acres, it’s not all raw land and some parts are already occupied by companies. The park is owned by Grupe Companies and it’s not clear if they would agree to hold out for a full-blown college campus, especially given that a CSU Stockton is probably 10 years away from fruition. Congestion may also be a concern, though the area is large enough that parking garages could easily be accommodated. Nevertheless, it’s my non-expert opinion that University Park is the most reasonable choice for a CSU Stockton. Do you agree? Disagree? Take our poll below and explain your choice in the comments section. ← Should Stockton lower building fees for greenfield development? I was a part of this project and I am also a Stockton native. While downtown Stockton is not necessarily the most feasible option it definitely opened up discussion of the importance of a CSU in Stockton and how to promote more mixed use development within the city. Nice to see that there has been further discussion following our work. If the government can use eminent domain to take property from citizens, chant they also take property from a corporation? After all, corporations are people. University Park makes the most sense. I’m glad to see that the idea of having a CSU in Stockton seems logical and necessary to it’s residents. While our discussed locations are not perfect, at least we’ve started a dialogue. If it’s possible to include CSU into existing infrastructure at University Park it would certainly be a step towards more condensed and better connected city. Parking maintains a problem in such spaces but finding a solution for large number of commuters inside city core could be interesting and applied to other cities as well. University Park sounds like a natural for a CSU-Stockton site. Another possible location is that huge North-West Channel front property located across from Louis Park and across from the Stockton Port. I also think the Mormon Slough and peripheral region south of Crosstown Freeway 4 and consuming the property between I-5 to the west and El Dorado Street to the east, and AMTRAK Line to the south would make a great and ambitious campus conversion and urban renewal project where the slough is environmentally cleaned up and transformed into a major central campus hub and community Urban Park with cascades, a brook, bike/pedestrian/jogging paths and recreational and meeting facilities, like an amphitheater and pavilion. High density residential development can be designed around it, creating a peripheral downtown satellite community to support adjacent downtown consumer economics and entertainment engagement. This will help create a great engaging neighborhood and vibrant social ambience for the students that is logistically close in proximity. I say use up the open land downtown by the DMV. Start by knocking down Weber Institute and the old school behind it.and start filling up the other empty sites next to them with other school buildings and housing. There is a total of I think 6 empty sites that are big enough and some are along the water too. For parking they can use the parking garage by the Arena and by doing that businesses might come an fill up the empty offices on the bottom of that parking garage. They can also build that bridge they were talking about to cross the delta. That area has apartments, a mini park and access to the freeway. The university worked with the City of Tacoma to repurpose abandoned buildings and redevelop that area. More google image searches of the campus and its map can show how a main campus downtown can still have open space and central points, along with historic buildings. A campus in downtown, as in other universities, could also have parking further out (so as to not ruin the urban fabric with parking craters and maximize utility of space) and run frequent shuttles. Students are pretty willing with exchanging cost with time and so would probably use a free shuttle (or bus with student bus pass) from a parking lot further out to campus. A good example of something like a University Park alternative would be to look towards Gonzaga in Spokane. 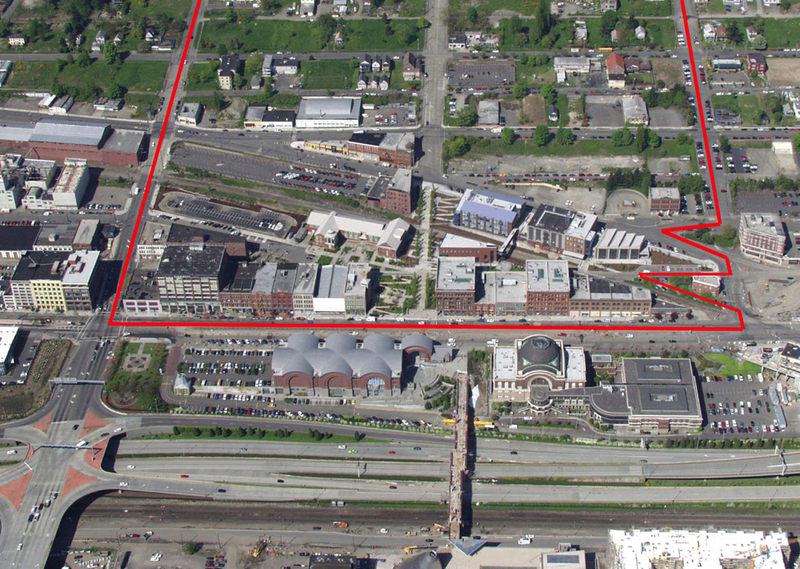 Also, forgot to mention…the UW Tacoma campus even has a rail-line running through it, where heavy rail trains pass by. I’ve asked students and faculty who’ve worked/studied there…and sound/vibration wasn’t an issue. They actually thought it was cool to see the train pass by every so often. This might open up an opportunity to build around the Amtrak station or straddle it…like in the Aurora/Main/Market area…and look! There’s already a park there!…and parking can be built under the freeway! …and most of the buildings are only 2-3 stories (there is 1 midrise for administration)! If you transpose that space on Stockton…you’ll see that actually, Stockton easily has that space in the core area. A two-by-two downtown block grid produces a ~775’x775′ space, much bigger than Laney College! And so my attention again focuses on the area around the Amtrak station. 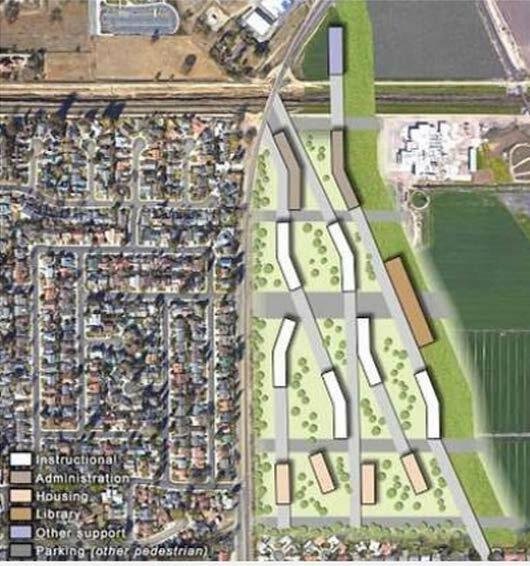 What if we utilize the 4-6, relatively undeveloped, blocks from Weber to the freeway and between Aurora and Union? 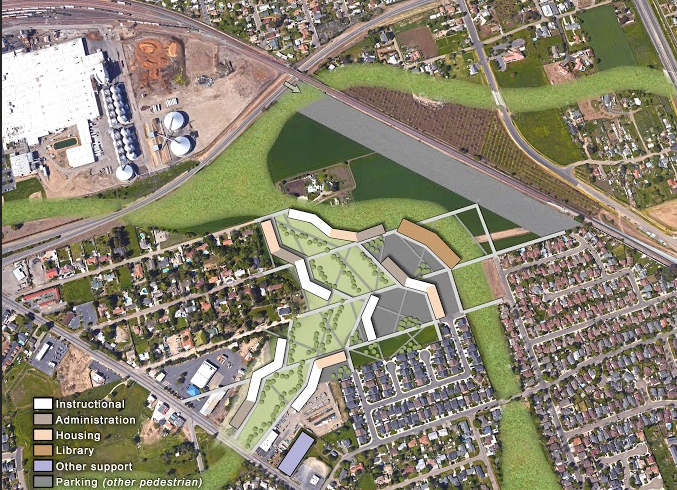 Future growth can extend south of the freeway or around that nearby grassy park through repurposing. You’ll be close to RTD, Amtrak, and I’ll hate to say it…the freeway! While it’s great to have a CSU Stockton, you must remember, we have UOP and Delta College (Largest Community College in CA). Do we need another University? There’s not enough students to go around for 3 schools in Stockton. Also the community impact, how much money do college students have to spend? sure, additional jobs will be created, but it will take away from the other 2 universities. We don’t need schools, we need attractions, a reason for people to come visit stockton (real museums, theme park, Outlet Shopping Center, ….) those types of things create jobs and buzz for the city. I agree, is it really necessary for a CSU Stockton? Delta is a good community college, and UOP is a great college. There seems to be no need for a CSU Stockton. and yea we definitely need more attractions in stockton such as a shopping district/center in downtown stockton. Swenson Park Golf Course.This site is in my opinion the best. I believe the City of Stockton operates it and maybe owns it. Plenty of acreage for new development nestle within the Oak trees. Very easy freeway access on the newly improved I-5. These golf courses are really not the best use of space. There are much better choices for golfers here in Stockton, but no better choices for locals wanting to go to college here in Stockton. Rocky, I think your ‘”opinion” is absolutely brilliant. I wonder what the city and community who use Swenson Golf Park might think of this CSU idea, considering its broader benefits to the community at large and its future. 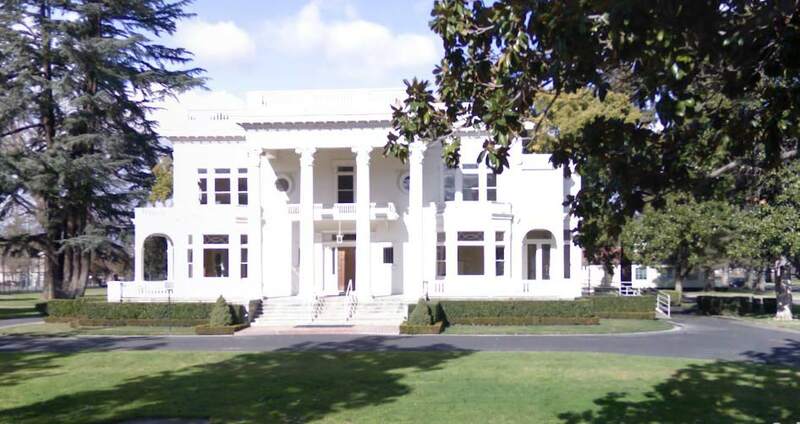 Stockton could negotiate retaining ownership for an annual lease of the property to the Trustees-CSU for the campus if not outright sell it for the city treasury, either way it would generate major municipal revenue for the city. The location would certainly make for a stunning CSU Campus with its historical oak trees, grounds and lakes, and there’s plenty of room for large scale structures, lecture halls, labs, gallery, library, student village, gym, sports facilities and impressive stadium. It’s layout already as a golf course would encourage a campus design of cloistered plaza facilities. Architect firms would go bananas at this opportunity because the design outcome will certainly be a guarantee award-winner due to integrating design function into this rich environment. Yes, it would be a beautiful campus and ample room for it. I’ve put a lot of thought into several locations, but none make much sense. A downtown campus would be nice and encourage development downtown which is great. Prime real estate would include the old warehouses just west of the ballpark. This site selection would certainly improve the midtown neighborhoods that are just begging for something like this to kick off somewhat of a renaissance within these communities to fix up all the historical homes in midtown.